Hardly anyone knows that I won the bullock riding championship at the Eromanga Rodeo in 1954, It isn’t that I am particularly proud of riding those poor animals, what is unusual is that Eromanga is said to be the most inland town in Australia. I have a whole family of grandchildren who call me Daije, because that is how one of them said my name when she was very small. Half of the family spell it ‘Daije’, the other half, ‘Daizhe’. Either is okay by me. When I was a little boy, an aunt told me not to be afraid and I was so afraid of her that I have not been afraid ever since. To make it active, use few adjectives, or passive verbs. Persistent, optimistic, brief, subtle (sometimes), experienced. I would be Wally, from WHERE’S WALLY? because then I could hide in the crowd and listen to other people’s conversations. I would travel back to 1954 and not miss the opportunities that were offered to me then. Aren’t you riding horses any more? My wife, Betty. She is a good pianist and a composer and she brought music into my life. I started writing so as to have illustrations published. My first story was published in London, with an illustration, then in New York, without. The next half dozen stories I wrote became radio broadcasts, so they had no illustrations either. I did get to read them though. ‘Fewer’ (it is neglected and more and more often people say ‘less’ when they mean ‘fewer’.) I like it because I always try draw using fewer lines and to write using fewer words than I did in previous drafts of a work. To read over and over and over again? Difficult, I know there is the book; but what is it? I enjoyed the language of Cider with Rosie and I met the writer a long time ago. ‘The rest of my life’ would not be such a great problem, I am already in my eighties. War and Peace might see me out. David Cox is an Australian author and illustrator living in Queensland. He has written and illustrated numerous books for children including a trilogy based on his own life. 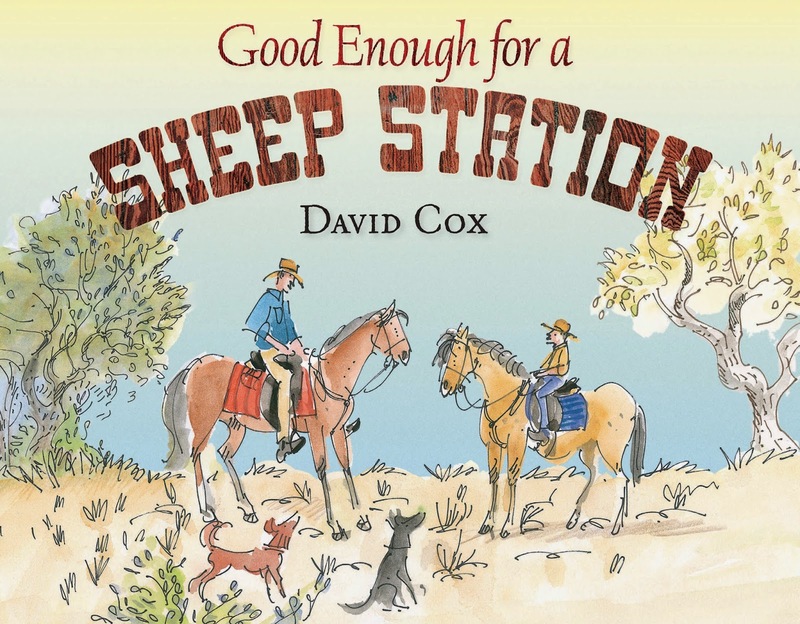 His latest picture book, Good Enough for a Sheep Station, is published by Allen & Unwin and is the third book in this triology (the previous titles are The Road to Goonong and The Fair Dinkum War (KBR review). Visit David's website to find out more about his books and illustrations.